Autentico paint workshops: Love chalk! Whether you’re looking for a fun and memorable way to celebrate a special occasion, a unique get together for members of your club or society, or simply a relaxing opportunity to spend time with your favourite people, an Autentico paint workshop ticks all the boxes! Get ready to don your aprons and learn how to transform tired old furniture or quirky vintage finds using Autentico Vintage, a versatile, easy to use paint, which contains 35% chalk for a fabulous natural finish. 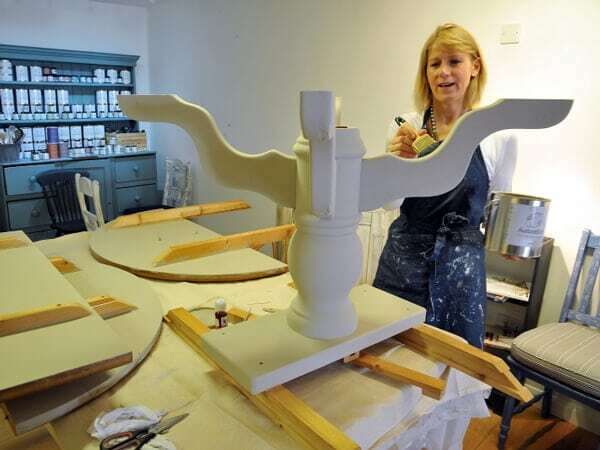 In this, your very own half day private workshop, you and up to four of your friends will learn how to apply Autentico Vintage paint and create wonderful effects and finishes, using sample boards which give you the freedom to experiment as much as you like. With all the tips of the trade under your belt, you’ll all be itching to give it a go again. So the sample boards are yours to keep and refer to when you start creating your own one-of-a-kind masterpieces at home. Here’s what we cover in this fun and fabulous workshop! A generous piece of Sara’s delicious home-made cake! so 5 people pay only £60 each! Our private workshops are very popular so book yours now to ensure you get the date you want.